Sheppard’s passion is helping people find and own their voice – at work and in life. She helps people access that part of themselves that allows them to know what they need. 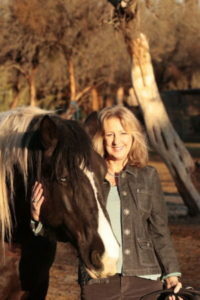 Pulling from 20 years of leadership development experience, she combines the partnership of a horse, powerful coaching tools and intuition to help identify and shift unhelpful patterns that get in the way. A Master Certified Coach and Facilitator, Sheppard offers coaching, workshops and speaking engagements for individuals, couples, teams and organizations. Sheppard holds a Master’s Degree in Organizational and Social Psychology from The London School of Economics. She is also certified in two personality assessments (MBTI and Birkman) as well as numerous personal and leadership development courses. While based in Arizona, Sheppard works nationally and internationally. She enjoys hiking, cooking, traveling and has recently taken up Tibetan Sound Healing.